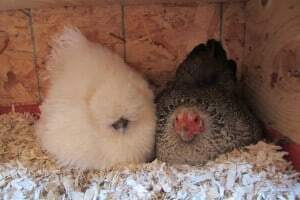 Backyard Chicken Adoption – A few months ago, one of our hens, Pigwidgeon, went broody. She was soon joined (literally, in the same nest) by her pal Hedwig. Some hens will sit on a nest for a few days and then go back to business as usual. So I kept an eye on these girls, and they all remained on their nests. We had recently dispatched our rooster, and I wasn’t sure if any of our hens’ eggs were still fertile. But I thought we’d give it a try. Two weeks went by and the girls were still setting. Pigwidgeon (Piggy for short) and Hedwig remained “connected at the wing,” sharing their combined passel of eggs. April was devoted, constantly clucking to her eggs. Was this going to be a successful Hen and Chick Adoption? When hatching time was upon us, I moved the hens to private maternity quarters. The brooding duo got settled in a dog crate inside the coop, while April had her own outdoor pen in the run with another dog crate for a nest. But the due date came and went with no sign of any peeping, pipping or hatching. Most likely the eggs were not fertile, though any number of things can prevent fertile eggs from developing and hatching. 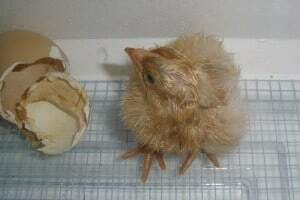 About that time I ordered a batch of Buff Orpington chicks from a hatchery. I got the brooder set up with lamps, but I was hoping that one or more of the broody hens would adopt some of the chicks. I was pretty certain Hedwig, who had been a doting mother of one chick last year, would be a good foster mama. I wasn’t sure about Piggy, who has been broody several times with no hatches. And April, just one year old, was broody for the first time. After picking up the hatchery chicks at the post office, I got them settled in the indoor brooder. That night after dark, I took six chicks down to the chicken coop and slipped two under each hen. Each of the mamas immediately responded to the chicks’ peeping with soft clucking. I watched them for a while, going back and forth between nests till I felt comfortable that the mamas were accepting the chicks. The next morning, I held my breath as I went down to check again, knowing that one or more of the hens might have rejected a chick. But there were three contented mamas with chicks peeking out from under their wings. Throughout the day I checked on them and saw the same domestic bliss in each nest. So the second night, we took all the rest of the chicks to the coop and placed them under the drowsy mamas. At the same time we removed as many eggs as we could find in the dark. The following morning all three hens were basking in the glow of motherhood. Hedwig shows her babies how to scratch for goodies. That was four weeks ago, and we now have two batches of healthy-looking chicks. Piggy and Hedwig raised 14 babies together; April has 9 little ones. I have to say I enjoy the freedom from brooder responsibilities! I still have to maintain two feeders and two waterers, but the mamas take the place of a brooder lamp. And I think the chicks learned to take dust baths and scratch the ground earlier than my brooder chicks have. Lately Piggy has been showing signs of being ready to leave the chicks: spending more time off on her own and sleeping on the roost at night while Hedwig snuggled with the babies in the nest. The other day I put Piggy in our other coop with the rest of our hens. Hedwig and April are still doting on their chicks, but it won’t be long before they, too, will start looking like they’re ready to go back to the general population. In just a matter of months, most of these little pullets will be laying eggs, and a couple of young roosters will be announcing the arrival of each new day at the crack of dawn. I actually miss the morning announcements–I’ll be glad to hear them again! Yesterday was a bad egg day at our chicken coop. Well it started out as a good egg day, but it didn’t end well. Hens need lots of light to stay on a steady laying schedule. Most are in their prime during the summer when there are long days of sunlight. That is, unless they are molting, dehydrated, or under some other stress. But most laying hens regularly produce eggs during the summer. During the winter, there is much less daylight than they need for regular egg production. So most of them naturally slow down. I say most because our Leghorns don’t seem to notice the changing length of daytime—they keep right on laying an egg a day even in winter. But our other breeds space their eggs out by an extra day or two when the days are short. 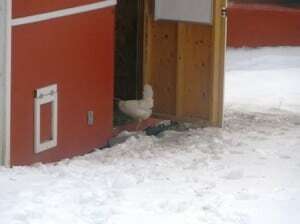 So unless they get artificial supplemental light, most hens take some time off from laying during the winter. Last year I set a timer to light the coop before dawn and after dusk to extend the hours of light. We had plenty of eggs. In fact, last year we had more than enough eggs. So this year we did not supplement the winter light. We’ve gotten a steady stream of eggs, but obviously every hen is not laying even every other day. This winter we’ve been getting anywhere from two to six eggs a day. Spring and fall, the daylight supply is in transition, and so is the egg laying. The days are getting longer, and the hens know it. The egg basket gets a little fuller as the weeks go by. Yesterday was a record day. There were nine eggs in the basket. Well wouldn’t you know it…I stumbled coming out of the coop. A few eggs dropped out and fell on the ground. Immediately some of the hens pounced. As I recovered my balance, I swung the egg basket a little too far. I could hear eggs cracking and then I saw more fall out onto the ground. Mr. Rooster then made his “Time for treats, ladies!” announcement, and more hens came running. A good rooster will not only protect his hens– he will also tell them when he finds something good to eat. And usually he’ll stand aside and let them have first dibs. Finally I regained my composure, but only two eggs made it to the kitchen. The bad news is I didn’t get to share the bounty of the day with any people. The good news is that the chickens all got a special treat that day. The protein and other nutrients are good for them. The shells provide calcium, which they need in order to produce more strong egg shells. And there’s nothing cannibalistic about chickens eating eggs that are served to them by humans. But really now–what I want to know is, was that my imagination, or were those chickens smiling when I tripped? Though we’ve seen a few snowflakes this week, spring is definitely here. With it comes fresh energy and enthusiasm for outdoor projects and growing things. There is a long list of things to do and thankfully, more daylight hours in which to do them. To our delight, our kids and grandkids have begun their spring-through-fall season of treks to the farm, which slowed down in winter to one visit for Christmas. A new adventure for us this spring is hatching our own chicks. Last year we raised 42 hatchery chicks, most of which were two days old when they arrived. We got that chick-rearing process down pat and decided to go a step farther this year. 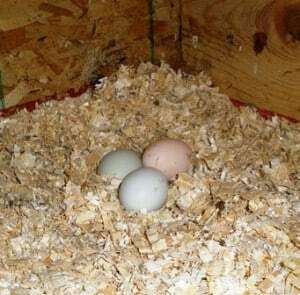 Although one can buy fertile hatching eggs, we want to reproduce our colored broilers and we do have a fine specimen of a rooster and several hens. 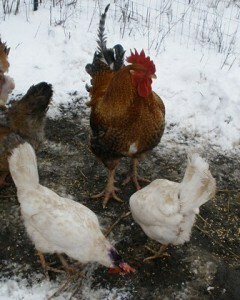 We are also interested in crossing the heavy broiler genes with our dual purpose hens for a possibly meatier egg layer. So the lucky rooster gained some more hens for his harem. We looked at the calendar to determine when the weather would be conducive to chicks moving outdoors at four weeks of age. Backtracking from there, we decided that a late March hatch date would be just about right. We collected a number of eggs and got them started in the incubator. The gestation time is 21 days, but it’s suggested that eggs be “candled” early on to see which ones contain viable embryos. Candling involves shining a light on the egg to show the air cell, blood vessels, and even little chicky eyes. It’s also possible to see the embryos moving around and tiny hearts beating. So at one week we candled the eggs and removed several undeveloped ones. Again at two weeks, we took out a couple of eggs. On the 18th day, when the eggs should be “locked down” and undisturbed, we had 12 viable eggs. An interesting thing had happened early in the month. A few days after we set the incubator eggs, one or our hens went broody. This means that she focused on becoming a mother and glued herself to a clutch of eggs, leaving the nest only about once a day to eat, drink, and take care of other business. She had no idea that her eggs were not fertile and would never hatch. Tiny Pigwidgeon (“Piggy”) is our smallest hen, a petite Dark Brahma banty. She was faithful and determined, and in three weeks I only saw her off the nest one time for a brief jaunt outside. Hopefully she took a break at least once a day. 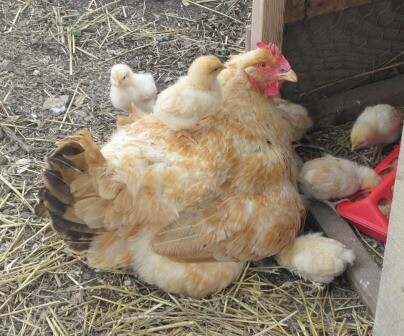 But a broody hen lives for one thing only: to hatch and raise some baby chicks. We decided to give Piggy half of the incubator eggs in hopes that she would hatch them. So on Day 18, we removed her clutch of infertile eggs to replace them with 6 viable incubator eggs. What a shock to see that she had accumulated 13 eggs in her nest, stealing the eggs her roommates had laid on the other side of the nestbox and hiding them all under her fluffy body and wings. Day 21 came and went, and by Day 23 three chicks had hatched in the incubator. But not a peep came from Piggy’s private nest. Unfortunately by Day 26 she hadn’t managed to hatch any chicks. Perhaps she was off the nest too long, or the coop was just too cold, or maybe all six of her eggs just happened to fail in the last days of gestation. We didn’t do eggtopsies, so we’ll never know for sure. Since Piggy had been brooding for three weeks already, with very little exercise and less food and water than normal, we removed her from the nest and took her private little brooder box out of the coop. We told her to go be a regular chicken for a while, scratching and pecking outside and regaining her strength. It didn’t take her long to remember the joys of fresh air, sunshine, and treats to be discovered in the chicken pen. If Piggy goes broody again, we’ll just give her some fertile eggs to start with and leave her to brood them. Piggy has two banty roommates, a Silkie and a Cochin—breeds that tend to become broody and will happily raise standard chicks, unaware that the chicks will soon pass them in size. 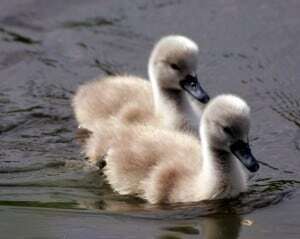 We also have two Buff Orpingtons that could become broody as well. The colored broilers we want to reproduce are not known for broodiness, so we may need some able foster mamas. Hopefully we will experience both natural and mechanized hatching and brooding and have the joy of watching some of our hens putter around with little chicks toddling after them. Today we’re starting our second incubator batch but won’t be surprised if spring weather also brings on the broodiness in the hen house. 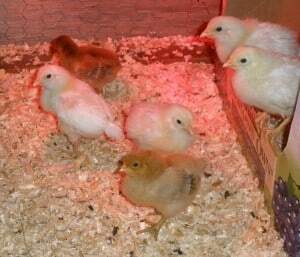 Meanwhile, these six little chicks are hanging out in our brooder in the barn, waiting for the day they can join their banty aunties in the coop and run. 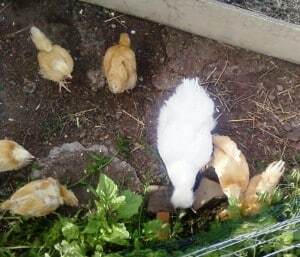 The four yellow chicks are hatchery White Leghorn pullets (young females) we bought to increase our laying flock. The two brown ones hatched a day apart in our incubator. The front one is full colored broiler, and the one in the back is a cross of colored broiler and Rhode Island Red. Twice a year I feel that my life opens up for new beginnings. The first is in January, the start of a brand new calendar year. The other is springtime, when so much outdoors seems fresh and new. When my kids were at home, there were also June and September, with the beginning of summer vacation and later the start of school in the fall. But now the school year doesn’t affect me as much as it did in those days. January is not far behind me, and the new year has almost passed through its first quarter. 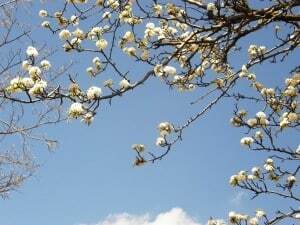 Now it is March, which I usually consider the beginning of spring. But this year, almost daily the evening news still brings a report of a snowstorm or two somewhere in North America. Is it winter that’s ending late, or spring that’s arriving late? I see signs though, that spring is definitely trying to spring. Bulbs have sprouted, trees are budding. I think I even heard a frog croaking the other day. And every once in a while, the sun shines so brightly and the air smells so fresh that it seems just…like…spring. What new beginnings will you embark on this season? Will you conjure up some ideas in your mind and sketch some out on paper? Will you try to grow a new plant, or raise a baby animal? Will you learn a new skill or hone a long-forgotten one? Here at our place we’re hoping to hatch some chicks, plant a new garden, and put in some fruit trees. Right now we’re trying to finish some indoor projects so we can give our all to the outdoor tasks. A little fencing here, a little construction there, and a lot of thought to our outdoor living spaces. There’s so much we’d like to do before fall comes around again. Even though it’s long past Christmas, I’m making a list and checking it twice. This is such a sweet post. We often have ducks or geese hatch chickens or guineas for us — but it makes for a confused hatchling later on! Lol. Oh, what a WONDERFUL idea! Why didn’t I think of this when I got our last batch of chicks?!?!? The brooder responsibilities — the mess — the time — argh. Oh my. I’m happy for you and the cute little Mama’s. I’m over from the blog hop. Nice to meet you. I wrote about some of my chickens too. Beth–it does save a lot of time and mess! I hope the timing works out again next time I have chicks. I’ll have to hop back over to the hop and see your chicken post. Hi Nancy–I can imagine the confusion, though we’ve only had chicken breed crossovers, not species! These Buff Orp chicks are already almost as big as the banty moms. Last year the colored broiler chicks grew even faster. Thankfully the mamas don’t know the difference. Thanks for hosting Rural Thursdays!